The Most Humane & Environmentally Friendly Way To Keep Potential Pests Out Of Your Garden! Uninvited cats and dogs can prove a nuisance damaging young shrubs, flower beds and fouling lawns. This new ultrasonic repellers provide 24 hour protection from those garden pests. This powerful Twin Speaker model produces powerful but harmless blasts of ultrasound which drives cats and dogs out of your garden. Gives 24hr protection over 8000sq.ft. with three frequencies and three volumes to repel cats, dogs, foxes, squirrels, deer, vermin and rabbits. 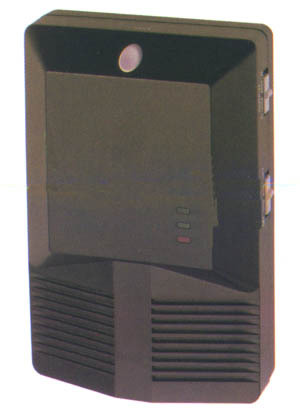 An optional PIR Motion Sensor Unit (shown in inset left) saves power by only triggering sound-waves when it detects movement. No more flies, mosquitoes or insects to bit or bother you ! The Ultra violet lights attracts all flying bugs up to 100sq.ft. around and on reaching the units zaps them instantly ! Use in any room in the house including kitchen or for barbecues, picnics , camping, caravanning, on the beach etc. A must for holidays abroad. Pop in 4 x 1.5 v ordinary batteries (not included) New Lightweight design. A Beam That's Half A Mile Long! The top model in this range of phenomenal new flashlights delivers the highest light output we've ever offered. 1.1.2 million candle power, which is several times brighter than car headlights! Currently used and recommended by both the Yorkshire Police and the MoD, these spotlights can penetrate smoke, rain and fog with a range of over one mile in clear night-time conditions. Unlike previous models, they have the added advantage of a unique rechargeable battery cassette (included) which snaps on and off the handle just like professional cordless power tools. Each fully charged battery gives approx. 20 minuites of full beam operation; for just £8.95 each you can buy one or more additional battery cassettes to extend usage time. 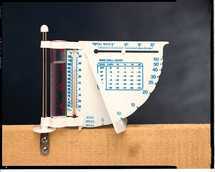 Damp Detector: Will detect rising or penetrating damp in internal and external walls - plaster, concrete or soothing. Gives essential information, especially before decorating or building works. Voltage Detection: Detects live circuits and broken cables - suitable for any voltage range. Metal Detection: Locates water pipes, electric conduit, studs or nails in wall cavities. This Portable Battery Powered Fan - Light has a multiple position fan head which adjusts forwards from 0 -180 degrees. Using alkaline batteries, the fan last up to 300 hours with a 2 speed fan setting for your comfort and a 3 blade design for optimum air circulation. The light is a 6" fluorescent replaceable tube light incorporated in a durable plastic housing. weatherproof, stain resistant and easy to clean. Picnic in comfort and keep you food cool! be loaded down on a day out? This clever idea provides the easy answer - the strong but lightweight frame holds the cool bag and also provides a handy stool for your comfort. Take it on day trips or to sports events! they burn. lantern Is ever 392 high so simply push them into grass or soft earth. Leave the. in pernanent positions or move them around as required. These pretty Garden Lights could set the mood for a dinner party,barbeque or drinks on the patio. 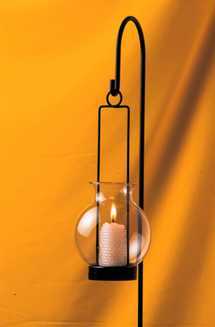 The Garden Lights will take a wide range of candle types (candles not supplied) - if you chose citronella candles the lights will double their function by keeping mosquitoes away as they burn. Lights are 95cm. Simply push them into grass or soft earth - they can be left permanently in position or moved around as required. 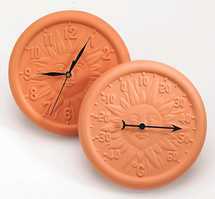 Clock requires 1 Size AA Battery, (Not supplied). Ideal for your balcony or patio. A full - sized greenhouse may be out of the question - but wouldn't it be useful to have one large enough to propagate seeds or help delicate cuttings on their way? Now this Mini Green-house could be just what you need ! The two shelves have plenty of space for pots or seedling trays, and the strong plastic cover has zips for easy access. Place the Mini Greenhouse on your balcony or patio or in a small garden or courtyard and it will make the most of the heat as it protects your plants from wind, heavy rain and pests like cats and birds. The Mini Greenhouse is sturdily made from powder - coated metal, tough ABS and PVC for years of wear. A terrific gift for any plant lover. Fits neatly on your balcony or patio. A full - sized greenhouse may be out of the question - but wouldn't it be useful to have one large enough to propagate seeds or help delicate cuttings on their way? Now this Mini Green-house could be just what you need ! The two shelves have plenty of space for pots or seedling trays, and the strong plastic cover has zips for easy access..
Building Your Own Greenhouse Couldn't Be Easier! The kit has everything you need to create a 15 sq.ft. tunnel like those used by commercial growers. 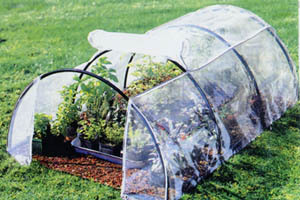 Perfect for growing early or late in the season as it shields plants from wind and cold. Provides moisture and protects seedlings from birds, insects and other pests. Includes 4 epoxy coated steel tubes to form framework, 6 iron ground stakes and zippered 0,20 gauge clear polythene cover. Weather and Mildew resistant. 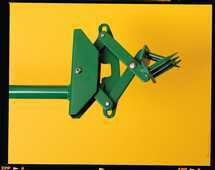 Frame and ground stakes are rust resistant. Easy no tools needed assembly, instructions included. Measures approx. 58"L x 44"W x 19"D (147 x 112 x 48 cms) and weighs just iver 10lbs. Any one who takes their hobby seriously deserves a dedicated set of tools and these are designed specifically for model building, carving, woodwork and other crafts. Perfect for the hobbyist, these professional- quality tools would also be a great inspiration for someone looking for a creative interest. Presented in an attractive wooden case. Set Comprises:-1 Coping Saw, 2 Blades, 1 Block Sander, 1 wood-working pencil, 1 precision screwdriver, 1 Bloke Plane, 1 set of Callipers, 1 Utility knife, 15 Assorted Blades, 1 Chalk Line Ruler and 3 (=6) burin w/blades. This Comfy Garden Kneeler/Seat takes the strain out of Gardening! Getting up and down to those garden chores can be quite a strain on both the back and knees, especially in the wet. This clever soft kneeler is a handy man's boon. Made of robust steel tubing designed around a raised, soft, comfortable kneeling platform of polypropylene foam, it also has arms that are just the right height to assist getting back up without back strain. For those jobs where you need a little height - just turn the kneeler/seat over for a comfy seat or handy step. Folds flat in seconds for easy storage. Ideal for gardens, DIY jobs, etc. Your favourite plants are always in danger of falling over, or being knocked by wind and rain, or if they are very tall, just by their own weight and height - now you can protect them and enhance your garden by these practical , adjustable Linking Plant supports. Simply place the supports around your favourite plants - the interlocking joints cannot come apart once fixed! Can also be used very effectively to train plants into the correct shape. Perfect for plants such as Lupins or Michaelmas Daises, the supports can be easily placed in any position you require, either holding one single plant or supporting a whole row. Sonic Molechaser Repels Moles Humanely. Moles or burrowing rodents can ruin your garden, but how do you repel them without having to resort to traps, harsh chemicals or causing them harm? The ingenious answer could be this sonic Molechaser. Just push the water-resistant stake into the ground, switch on, and every 15 seconds it will emit a deep vibrating sound (300HZ frequency) that has been found to remove moles within the vicinity. Molechaser is safe, guaranteed waterproof, measures a discreet 28cm (11") long, and uses 4 x size D batteries (not supplied). Attach the Rotary Sharpener to any electric drill with a chuck of 6.5mm or more, simply disable your lawn mower, turn it on its side and secure the blade, then run the specially angled grinder along both edges to create an 'as new' cutting edge. The Rotary Sharpener can also be used to sharpen many other garden implements, i.e. spades, hoes, axes, shears, lawn edges etc. These attractive obelisk are made to the same design as those used at the Chelsea and Hampton Court Flower Shows, and are reminiscent of designs used for hundred of years in garden designs and landscaping. They add beauty and style to your garden and are perfect for climbing plants, giving height and interest to every corner and border. Sizes available : Small, Medium and Large. The weather station easily fixes to posts or greenhouses and records round-the-clock daily, weekly and monthly rainfall, checking that your plants are getting enough water. It has an integral thermometer, wind speed & wind direction indicators and a wind chill chart to save your plants from freezing. These latest Ultrasonic Rodent Repellers produce powerful 110db Ultrasound, which drives away rats and mice - FAST! Laboratory tests show that unlike ordinary repellers, the unique patented Attack Wave system constantly changes frequency - so that rodents never become resistant. 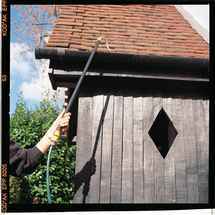 Ideal for homes, outhouses and farms, a humane and inexpensive alternative to poisons and traps, and harmless to humans and pets. Single Speaker Pest Repeller covers 180 degrees at 2000sq.ft. (both runs 24 hours only with mains adapter - supplied). 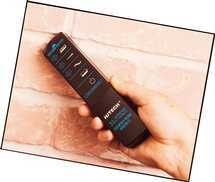 New latest ultrasonic and electromagnetic interference technology is combined in a slim plug-in device. Pestaway Deluxe works 24 hours disrupting the nests of pests where insecticides and traps can't reach. Independent laborotary tests show Pestaway Deluxe protects against rats, mice, cockroaches, ants, etc. over an area of 3000sq ft. Simply plugs into any mains oulet and costs less than 1.5 pence a day to run. Twin speaker plus 3 frequency selection and intermittence sweep ensures pests do not develop immunity. Built in night light feature. Size 15 x 10 x 2.5cm. 5 years guarantee. Ideal for the conservatory or garden, these elegant honey coloured wood and green painted steel units can be used separately as corner or rectangular plant stands, but they easily match together to form a complete, round-end unit. The corner units can be used to form a half-moon shape against a wall, or put four together to form a focal point in the whole room, while rectangular shapes can fill the width of a whole wall. The Plant Wizard allows you to give your plants, shrubs, vegetables and trees the optimum growing environment. 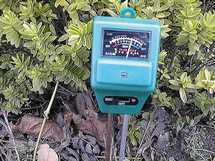 Take the guesswork out of garden care. Ensure perfect soil and light conditions for every plant. Prevents overwatering and root rot. Ensures perfect acid or alkaline soil conditions Ph for healthy vigorous growth. Saves your precious shrubs from unhealthy soil, wet or dark environments. 3-switch positions. No batteries required. Pop Up Tidy Bag Pop open the Tidy Bog and create a large, 2-handled container that can carry leaves, branchs, lawn cuttings, etc. 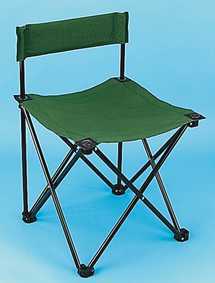 Made from rugged, water resistant polyester with a strong steel frame and spring mechanism, to provide a rigid hin for garden waste, which collapses flat when not in use. You can also collapse it on one side to form a "dustpan" for sweeping up leaves etc. This Cleans cars, vans, boats...fast! 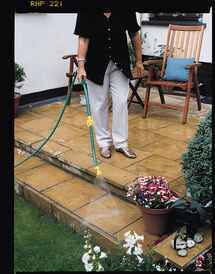 Makes cleaning fun and supplies your outdoor cleaning requirements in one- and can he used just as ~ easily to water your garden! The fully adjustable shower head features 5 different spray patterns; Fine, V-Jet, Power Jet, Shower Jet and Direst Jet - and the easily fitted interchangeable Heavy Duty Sponge Head and the Brush Head make quick work of cleaning your vehicle, windows, paths etcl You can add the soap or detergent of your choice to the Soap Container The long barrel is optional, so you can get closer for those really difficult jobs! Australian invention clears out weeds in minutes and you never need to dirty your hands or bond your back. 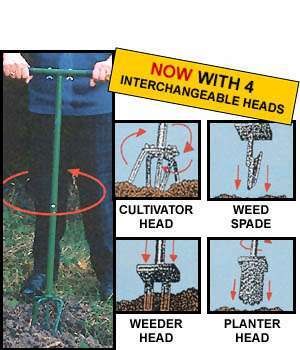 The Ripper Weeder is easy to operate by hand or foot in one simple movement. 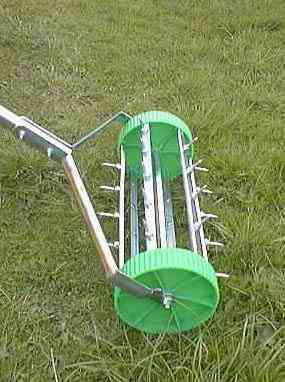 Strong rustproof steel ensures that the Ripper Weeder will work for years. Add instant height and interest to your garden with this affordable new archway. Made from strong tubular steel with a corrosion-resistant green enamel coating, the arch is ideal for spanning a path, creating a attractive fragrant 'gateway' from one part of the garden to the other. In fact with it's working height of 1.97m (78") and width of 1.20m (59") it is also tall enough to act as a pretty porch around your front or back door - especially when entwined with old-fashioned roses, honeysuckle or a vine. Arch measures a total of 2.13m (84") high, including 46cm (18") for 'digging in' below ground level to ensure maximum stability. Simple self-assembly required. Simply revolve the RotaMate's strong teeth to easily loosen the soil and mix in fertiliser or compost. The strong spikes make short work of even the heaviest soil and the clever design means you con't even have to bend and lift - saving your back as your work. The RotaMate's compact size means it's easy to work round plants and avoid damaging the roots of valuable shrubs, while you get through the cultivation so much faster! Enjoy a Beautiful FloatingSolar Powered Fountain In Your Pond. This cordless, solar powered, fountain requires no installation. 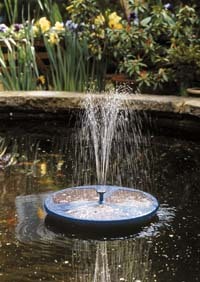 The high tec solar function creates a beautiful solar powered fountain of water in your pond. Requires no wiring, runs on the power of the sun - completely cost free. Simply float the solar fountain unit on the water and let the sun do the rest. The high efficient solar panels can create a fountain up to 18" high in bright sunshine. Includes a choice of 3 nozzles for different fsolar powered ountain effects. Measures approx. 16" dia. Why spend money on new tools for every job. This Power tool kit will do the lot! Sands, saws, sharpens,drills, cuts and shapes. It can be used on wood, ceramics, metal and glass laminates. 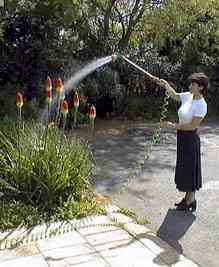 I made from rust-free ABS plastic, has a comfy thermo grip handle and is speedily attached to your garden hose. Easy eco-friendly weeding, no chemicals just a touch of the Weed Wizard applies a high temperature flame which instantly destroys the weeds internal cell structure causing them to wither and die within a day or two. Eliminates the need for toxic or hazardous chemicals. Weed Wizard leaves the garden completely safe for children and animals immediately after use. The gas supply is turned on by means of a control knob, and ignites at the end of the Weed Wizard when the piezo electric button is pressed. Ideal for driveways, patios, walls, rockeries etc. 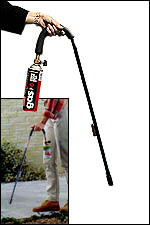 Can also be used for de-icing pavements, frozen pipes, lighting BBQ's. Runs on easy to obtain Butane gas cylinder (not supplied) readily available from most good DIY stores. The UK's Lightest Fold-away Wheelbarrow ! Most wheelbarrows are heavy, bulky things which take up valuable storage space - but not this one. It's sturdy, tubular steel construction and tough tear resistance woven polypropylene pan can carry up to a 45.5kg (100lb) payload ! When not in use it simply folds flat and can be hung on your garage wall. Slim enough to even fit into a car boot ! Fitted with a handy pocket to hold garden tools and gloves, etc.